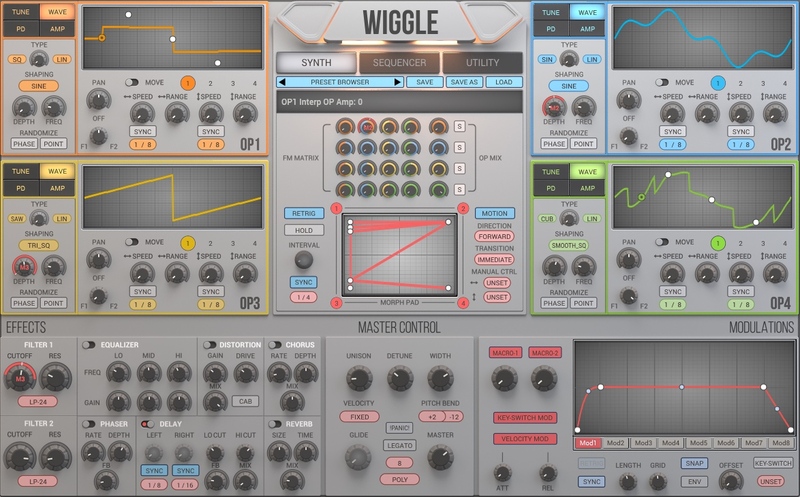 2nd Sense Audio's WIGGLE is a synth plug-in aimed to assist electronic musician in creating expressive sounds with its distinctive dynamic waveshaping engine and intuitive user interface. 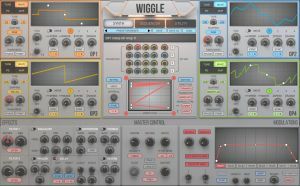 Expressive Sound – 4 powerful sound generators allow you to directly manipulate and automate the wavetable. 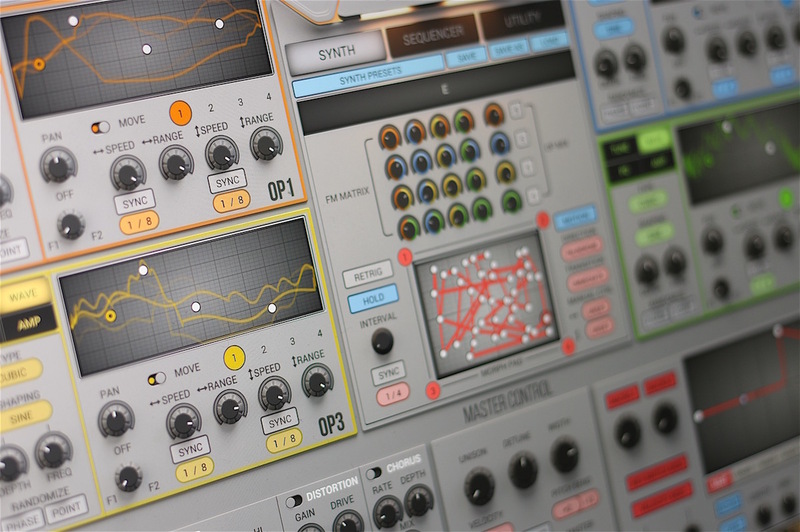 Together with waveshaping, phase distortion and randomization tools, creating expressive sounds is effortless. Flexible Modulations – 8 free drawing LFO/Envelope and 4 specialized modulators can be drag-and-drop to control most of the synth parameters. Another 8 step-based modulators are also at your disposal. 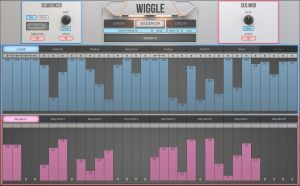 Powerful Morphing – Most of WIGGLE's parameters can be captured as a "snapshot". You can take up to 4 snapshots of the sound you're working on and morph between them smoothly, either manually or automatically. It's up to you to create subtle timbre variations or drastic transformation of sounds. Intuitive FM – The color-coded FM Matrix clearly shows the modulator/carrier relationship. 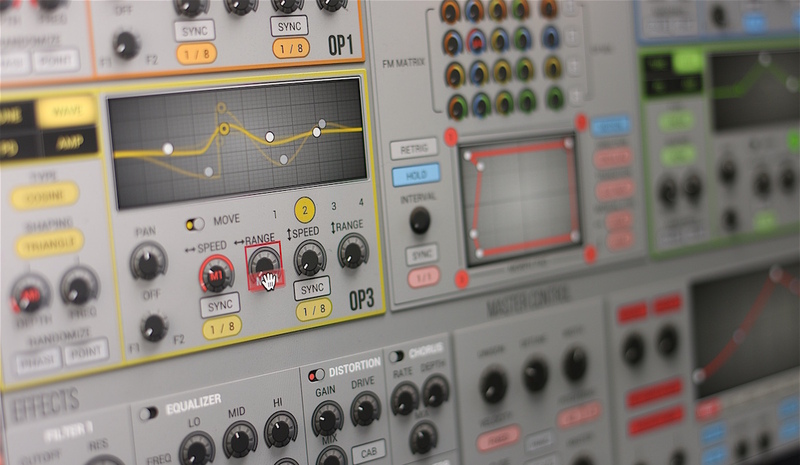 All the parameters on the matrix can be modulated. It's easy to add complexity and character to the sound. 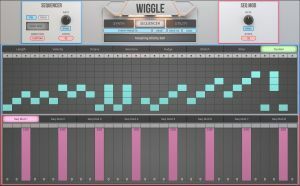 Versatile Sequencer – WIGGLE's step sequencer offers you detailed controls to arrange both musical and modulation patterns. 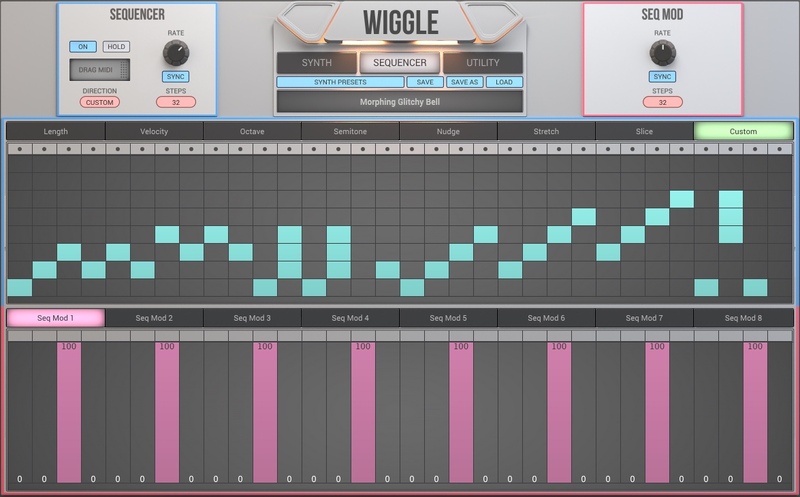 The resulting musical pattern can be dragged into your DAW. 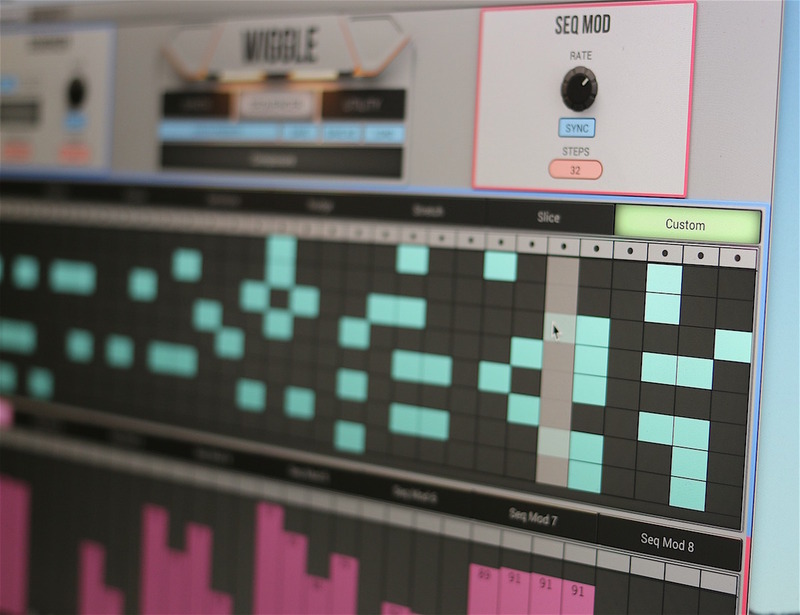 Convenient Sampling – WIGGLE's internal recording function allows you to quickly capture your sonic experimentation and drag the audio file to your DAW or desktop for further editing and archiving. Color coded FM Matrix – The FM Matrix clearly indicates the modulator/carrier relationship between the operators using color coded knobs. Modulations – 8 free drawing LFO/Envelope, 8 step-based and 4 specialized modulators can be drag-and-dropped onto most of the synth parameters. Morph pad – Morphing between 4 variations of a preset captured on the Morph Pad multiplies the degree of sonic expressiveness. You can also draw an arbitrary path to automate the morph process. 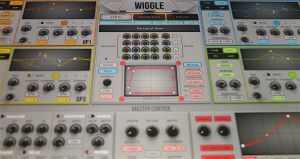 Built-in effects – 7 built-in effects can also be modulated and make a WIGGLE sound more interesting. 4 Operators could go through duo multi-mode filter parallel. 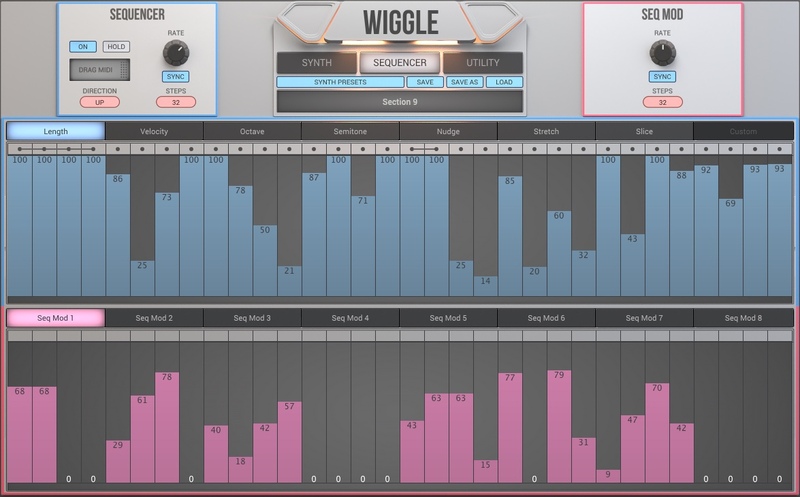 Step sequencer – The sequencer offers you precise control over each step for creating musical pattern with human feel. 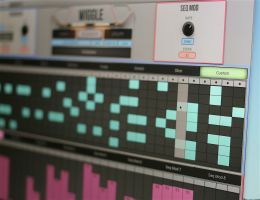 The resulting sequence can be dragged out as a MIDI file. Built-in recorder – A simple built-in recorder helps you quickly sample a sound tweaking process. The resulting audio can be dragged out as a wave file. Retina ready – High resolution images of the user interface are prepared for better viewing experience on retina displays. 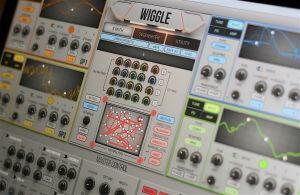 Interactive guide – A short interactive tutorial walks you through the basic functions of WIGGLE upon its first launch. You will get to a good start point in minutes. 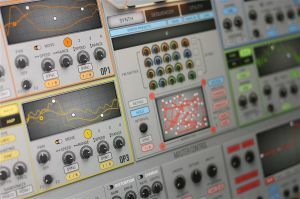 Compatibility – VST, AU, AAX, Standalone, Windows/Mac OS X, 32/64-bit supported. "As Alan Watts says, 'The world is a marvelous system of wiggles.' 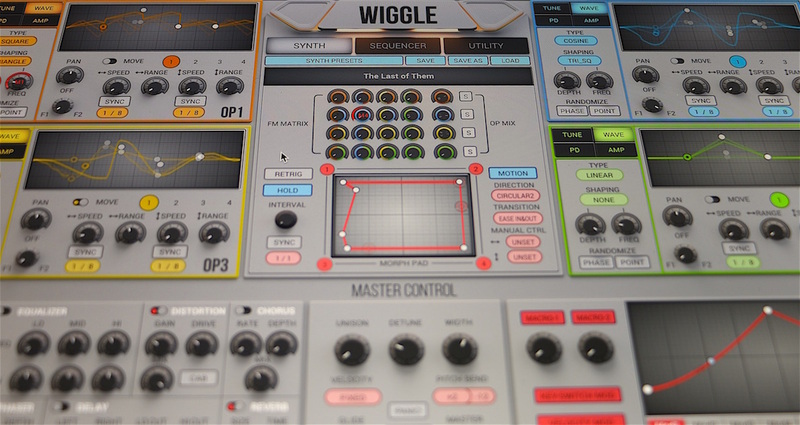 It has always been a challenge for electronic musicians to sufficiently reflect the wiggly nature of sound and human emotion with limited tools in the digital realm. We take up the challenge with WIGGLE. It's designed to assist musicians in crafting lively, intriguing sounds with its distinctive synthesis engine and intuitive user interface. Be adventurous and happy wiggling." Please visit 2ndSenseAudio.com for more detailed sounds and videos.